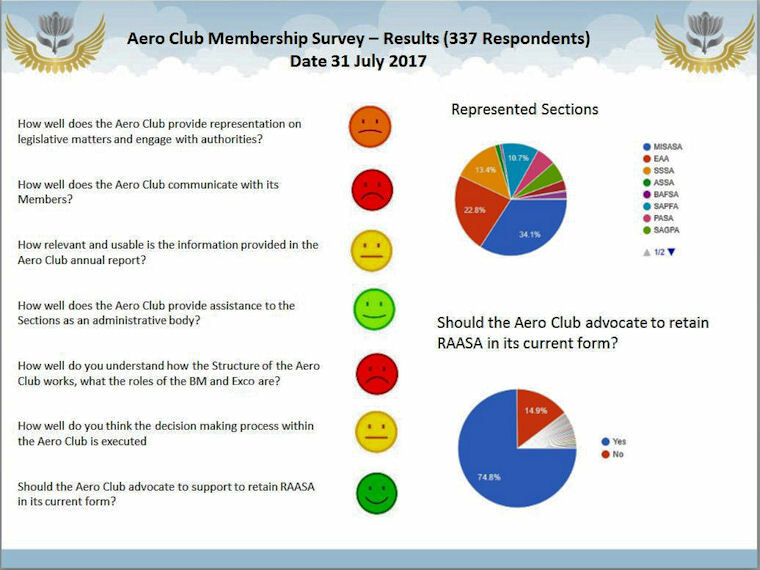 ►There was significant response by the majority of members on the lack of focused communication by the Aero Club of its activities, dealing with topical issues, structure and general communication. 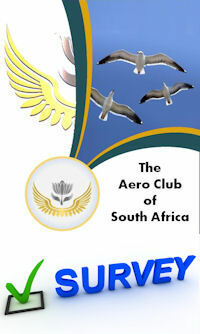 ►There was also a majority view of membership not understanding of the role of the Aero Club in the context of an overarching body representing recreational aviation, and neither the functioning of the Aero Club within the structures of the aviation landscape. ►There was overwhelming support (75%) for keeping RAASA as it is, although many negative issues were raised, it was felt that these could be resolved through adequate discussion and negotiation. Of these an opinion raised frequently was for RAASA to be an administrator and oversight body with Aero Club being the legislative initiator and driver. 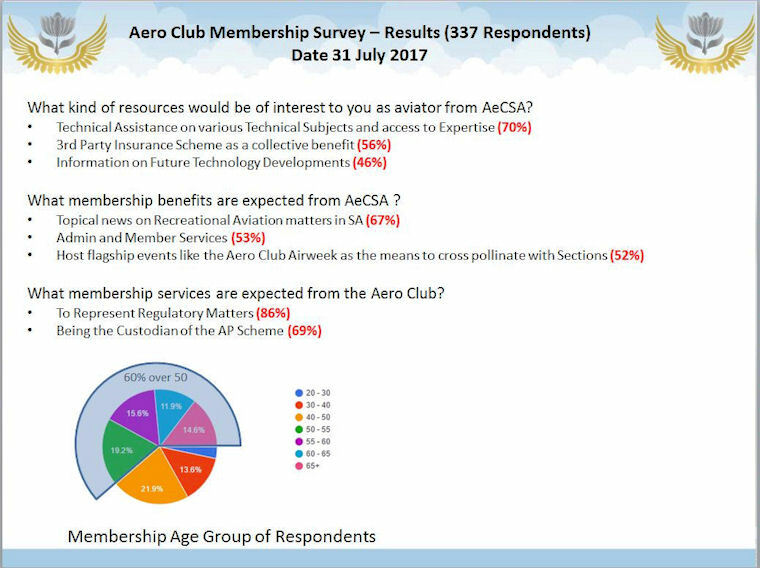 ►Another key issue raised was the need for the Approved Persons scheme to be fully controlled by the Aero Club and its sections. ►A mid-year analysis of the Aero Club membership data established that more than half of our members are 50 years or older, with 5% being female. Overall the females are generally younger (nearly all between 21 and 50 years old). This is good news as it means we are becoming more attractive as a sport to females. Aero Club does not currently log racial ethnicity for statistical and transformation purposes, but we intend to do so in future to establish trends. ►Three quarters of the members live in either Gauteng (43%), KZN (10%) or Western Cape (22%). There are 50 foreign members. ►First and foremost being an improvement in communication structures to cover the first two points above. ►Secondly, the legislative environment of Aero Club, RAASA, CAA that is currently in flux is being addressed with focussed attention to ensure our maxim of preservation of free flight is maintained and promoted.